Scottish politician who was the leader of the Scottish National Party, and elected First Minister of Scotland in 2007. He is also a voice of warning for global warming and has pushed for Scotland to be more conscious of emissions and the efforts to create forms of renewable energy. He studied Economics and Medieval History at the University of St. Andrews and became Assistant Economist in the Department of Agriculture and Fisheries for Scotland in 1978. 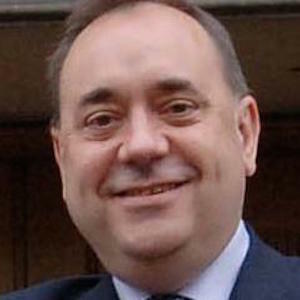 In November 2012, he became the longest serving First Minister of Scotland. He married Moira McGlashan in 1981. He collaborated with Prime Minister David Cameron on The Edinburgh Agreement in 2012.